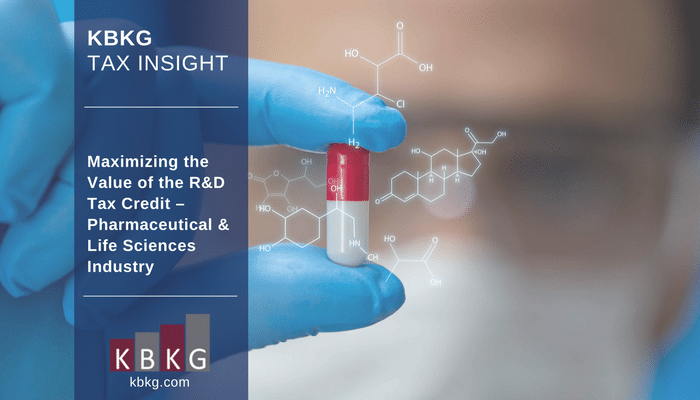 It is no secret that many Pharmaceutical and Life Sciences companies (“Companies”) conduct research and development activities that qualify for numerous tax incentives, including the Research and Development (R&D) tax credit. Recent groundbreaking legislation created a level of certainty for tax planning purposes and also includes provisions geared towards providing significant benefits to small businesses and start-up companies. While Companies are beginning their tax planning for the coming year, it is an optimal time for management to evaluate whether they are taking full advantage of the R&D tax credit. For instance, there are often additional benefits left unclaimed and/or fully maximized due to a lack of knowledge, expertise and/or resources. Historically, the following areas were thought to be high-risk and/or too complicated to substantiate. Therefore, all or a portion of the related expenditures were excluded from the calculation of the R&D tax credit. The above discussion highlights just some of the areas where additional benefits continue to go unclaimed. Substantiation is the key to establishing qualification. The company must identify, review, analyze and document the qualified nature of the activities and related expenditures. The analysis should be considered in light of your company’s specific facts and circumstances and should include evidentiary documentation. Action Step: There may be significant tax savings related to the above that went unclaimed in the past. Pharmaceutical and Life Science executives may want to take another look at their R&D tax credit calculations to ensure that they are claiming the maximum available benefit that they are otherwise eligible to claim. What are other tax incentives that the industry of pharmaceuticals are exposed to? I understand that R&D is important for pharma but other incentives are usually overlooked. Thank you for your comment, Noni. Often overlooked but equally as important can be the orphan drug tax credit and, although repealed prospectively, the section 199 manufacturing deduction if the drugs are created in the United States.